The year 2048. Rick Janssen, his wife Abi and their son relocate to a NATO research base. Earth is becoming overcrowded and its resources depleted – the hope is for humanity to relocate on Saturn ‘s moon Titan, the most Earth-like of any world in the solar system. Rick has been chosen by project head Professor Martin Collingwood as one of several prospective subjects to be the first to land on Titan. However, Titan’s atmosphere is 98.4% nitrogen and to survive there human beings have to be modified. Rick and the other volunteers are given injections that begin to change their biochemistry. Soon they can breathe underwater for lengthy periods, feel no cold and have their eyes adapted to see at different light levels. As other volunteers experience medical meltdowns or go crazy, Abi realises that Collingwood’s experiments are heading into dangerous and unethical territories. The Titan was a directorial debut for German director Lennart Ruff. Ruff directs from a script by Arah Amel who previously wrote Grace of Monaco (2014). Financing was derived from various international sources and the film was released to Netflix. I thought The Titan had a good deal of promise when I initially read about it. It reminded me a good deal of the very excellent novel Man Plus (1976) by Frederik Pohl about engineering a man to be able to live on Mars. And as the film starts in, Lennart Ruff directs with a coolness that soon starts to impress. This is a film where those involved in the writing have made an effort to research the science. This could easily be another human transformation horror film – something like SSSSSSSS! (1973) comes to mind – but for the careful tone of scientific enquiry rather than shock effect. 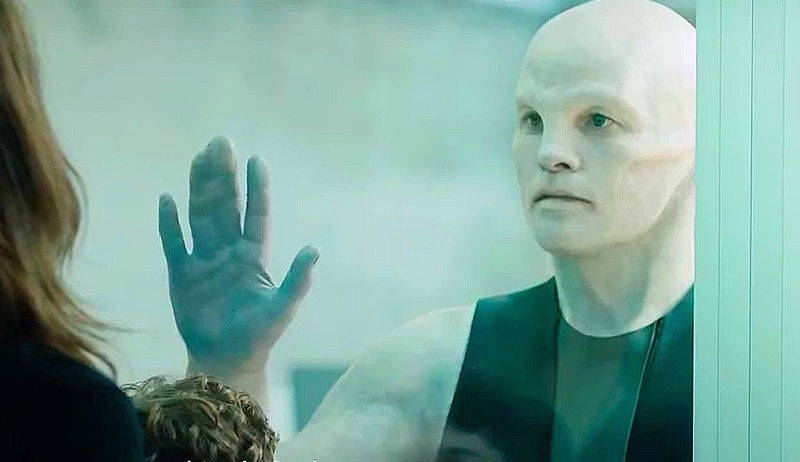 There is a fascination during the build-up scenes where we see Sam Worthington calmly sitting breathing at the bottom of a swimming pool or unable to feel cold after placing his hands in a container of ice. There’s the eeriness of seeing him slowly becoming something less and less human, even as the rest of the volunteers start to go crazy or medically collapse. For about its first half, The Titan seems like it is going in promising places. On the other hand, it is as though having created a conceptually ambitious science-fiction work, the authors burned themselves out and/or were forced to curb their ambition for the sake of budget. The second half of the film turns in desperately unoriginal directions. Taylor Schilling as Sam’s wife becomes the point-of-view character and the film champions her outrage at what is being done to her husband – in moving to the island with Sam and presumably sanctioning his volunteering for the program, did she never countenance the idea that he was going to be changed into something non-human? Tom Wilkinson’s project head abruptly becomes a mad or at least ruthlessly unethical scientist who is pushing the project beyond all human limits etc etc. The last half-hour becomes a series of cliche monster/lab experiment amok scenes with Sam Worthington on the run pursued by soldiers ruthlessly determined to eliminate him. The scene where the military stand down and refuse to shoot two unarmed women – after having pursued and unquestioningly killed others – is absurdly melodramatic. It may say something about how much of a conceptual letdown that The Titan is when the title location is only visited in the last sixty seconds and the concluding shots of the film.